This week, our inkjet printer kicked the bucket – but it’s not really a bad thing, since the Canon Pixma iP4200 lasted almost eight years on a single print head and the same set of refilled ink cartridges. It was only our third inkjet printer and the fifth altogether, but the one that lasted the longest. Bought in August 2006, this printer has gone through thousands of pages of text and hundreds of photos, all in absolutely brilliant quality especially considering that it had originally cost less than 90 Euro. Actually just the print head is broken – the printer itself is still working, but since a replacement head would cost almost as much as a completely new printer, it’s now time to buy a new one now. I can almost hear the cries, “Inkjet printing is terribly expensive!”, but that’s simply not true. While there are mechanisms in place that try to prevent refilling the ink tanks, they can be easily overridden on Canon printers so you can just re-use the original cartridges. There are no real ink level sensors on these tanks, the printer drivers just decide that ink tanks get empty after a certain amount of pages. This is why switching off this feature is absolutely no problem – after all, the ink tanks are transparent and you can always check how much ink is left by just opening the printer hood and pop out one of them to look at it. Refill ink sets cost between 15 and 20 Euro for a set of five 20ml bottles of ink – I have been using the KMP RU5 set since the beginning and never had any problems with it. The refilling takes a bit of practice and is kind of messy, since you need to squirt the ink with a syringe into a hole you have to drill yourself into the top of the cartridge, but if you get used to it, you can refill all five cartridges in less than fifteen minutes. Each set of bottles is enough for about four refills, which is ridiculously cheap considering a complete set of original Canon cartridges costs about 50 Euro! 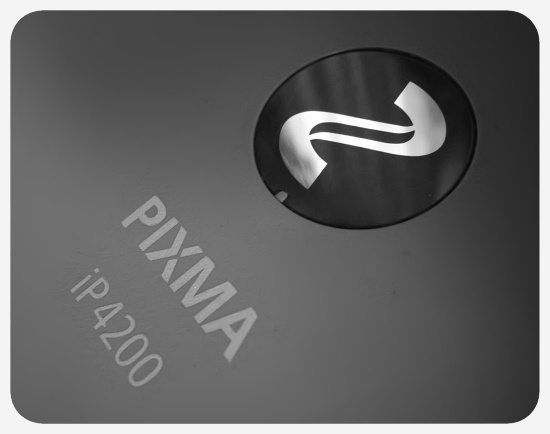 This is why our new printer is going to be another Canon – the Pixma iP7250 to be specific. Originally, we wanted to buy it in our local electronics store, but guess which printer was the only one they didn’t have in stock anymore? This is exactly why we do our electronics shopping mostly online nowadays. If the local stores can’t keep up then I’m sorry, but I had to order the printer from Amazon anyway and it’s probably going to arrive tomorrow or on Monday. The good news is that it’s going to cost only about 80 Euro – hopefully it will last as long as its predecessor, who is not going to be put away, but into storage as backup and in case I can find a replacement print head one day that does not cost as much as a new printer. But I’m excited about the new printer – it has more resolution and even WiFi, which will come in very handy as a network print server. Maybe I will do a little product review, but done right this could take some time – nevertheless, stay tuned for more printer shenanigans and maybe an article about our printer history all the way back to the late eighties with the dot-matrix noisemakers :-). 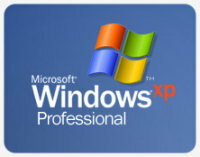 Everybody is making a huge deal out of the fact that Microsoft has ended support for Windows XP on April 8th and some media outlets even claim that the lack of patches will result in XP being a hacker’s paradise. Nothing could be further from the truth – although upgrading to at least Windows 7 would be a wise choice for businesses, there is really no need for the private user if there are good reasons to stay with XP. The current media brouhaha about the end of Windows XP only amounts to simple fearmongering towards less experienced users who Microsoft wants to buy their latest operating system. The main problem is one that Microsoft have created themselves – with XP, they had built the first really well-working version of Windows that has lasted for over a decade and will probably last much longer. The failure to produce a worthy successor after a couple of years was perhaps the worst mistake, with the debacle of Vista over five years after XP’s introduction making the older system only more popular. When the real successor Windows 7 finally appeared in 2009, it was practically too late to really convince legacy users to upgrade – and I’m only talking about private users here. But what really happens now with Windows XP? The short answer is: nothing! The operating system will simply continue to work and it won’t get much less secure if you take some very simple measures. The bottom line is that it’s not really the OS that is the security risk, but the programs that run on it. If you have your computer connected through a router and have the most dangerous ports blocked, use a permanent virus scanner and keep your web browser(s) updated, there is no reason to think that Windows XP is automatically insecure. Also, just because Microsoft has chosen not to make its Internet Explorer above version 8 compatible with Windows XP does not mean you can’t access the web on an XP machine safely anymore – just use a real browser like Chrome or Firefox (sadly, Opera doesn’t really belong on this list anymore). There are still many reasons to keep using Windows XP and almost all of them have to do with the hardware. Microsoft says you should upgrade your computer hardware NOW, but if you simply can’t afford it or if you have some legacy card around which needs XP to work, you are stuck. I still have to use XP on my main computer because there are no other drivers for my trusty old WinTV capture card which I use to digitize videotapes. I probably would have been able to install Windows 7 on my notebook when I changed harddrives last year, but since it only can take a maximum of 1 Gigabyte RAM, XP is still the leaner and faster option – and my secondary backup laptop, a little Pentium-III subnotebook with only 384 Megabyte RAM, would choke on anything bigger than XP. In the end, buying a new computer just because XP is supposedly dangerous is utter nonsense. 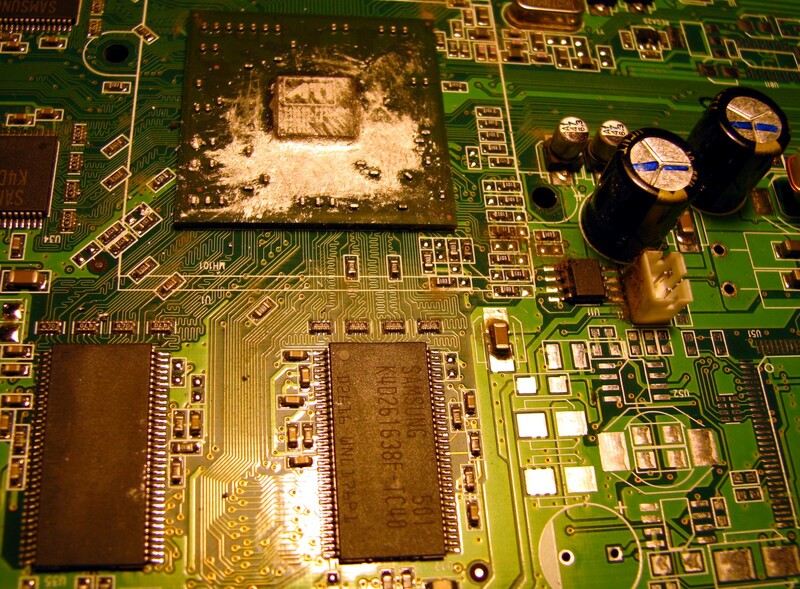 Keep your hardware, keep XP running. The only feasible alternative would be to switch to a Linux distribution, which I would do in a heartbeat if there were not some Windows programs I have gotten so accustomed to that I can’t live without them. But if you just use your computer to surf the web and do some office work, chuck out Windows altogether and switch to Linux and LibreOffice. Try out Ubuntu or openSUSE, two of the most easy-to-use Linux distributions around which are far less complicated to use than they were only a decade ago. They don’t cost anything and you can try them out with a bootable DVD first without installing them on your harddrive. The bottom line is that if you take some very simple security measures and you like your computer as it is, you will be absolutely fine. It may sound like Microsoft is forcing you to do an expensive upgrade, but in the end it’s all an artificially produced end of life of an operating system that doesn’t really deserve a premature death. 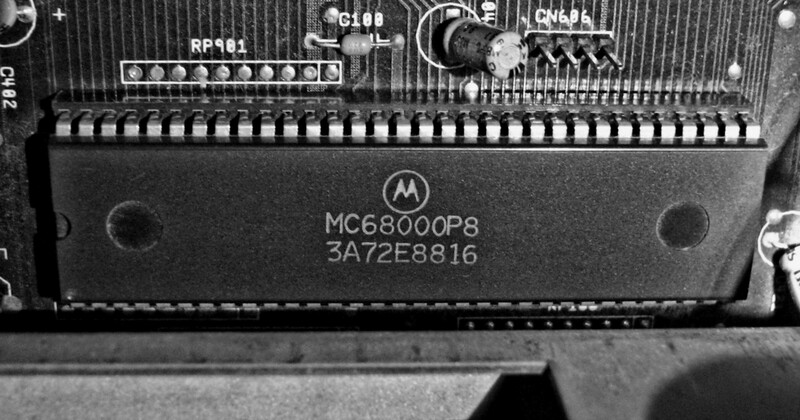 Vintage Computing: Revisiting and old Friend? So, should I or should I not? 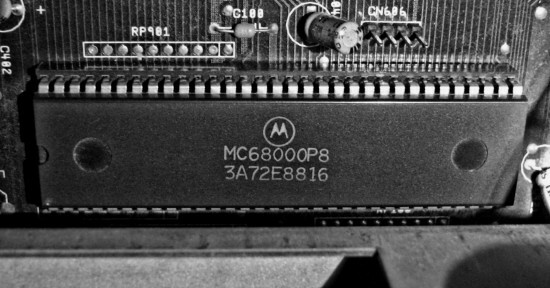 I’m still not quite done with the 8 bit era, but I’ve taken a little break with the Vintage Computing series and soon I will have to change over to 16 bit and write about that wonderful computer that was built around this chip. It’ll be a lot of fun, but it will also take some time. Well, that went more quickly than I expected. On Sunday, the graphics card of my big computer died, but I found a replacement on Ebay soon. I actually snagged up the first ATI Radeon 9600 from a good seller I could find, but I think it was a good choice since it has an original ATI cooler and heatsink. It’s a little louder than the Arctic Cooling sink I had put on the previous card, but if it cools better then I can stand the additional noise. And it’s got a pretty snazzy artwork on the heatsink, which is actually the reason why I’m posting this article (you can click on the image to enlarge it) :-). 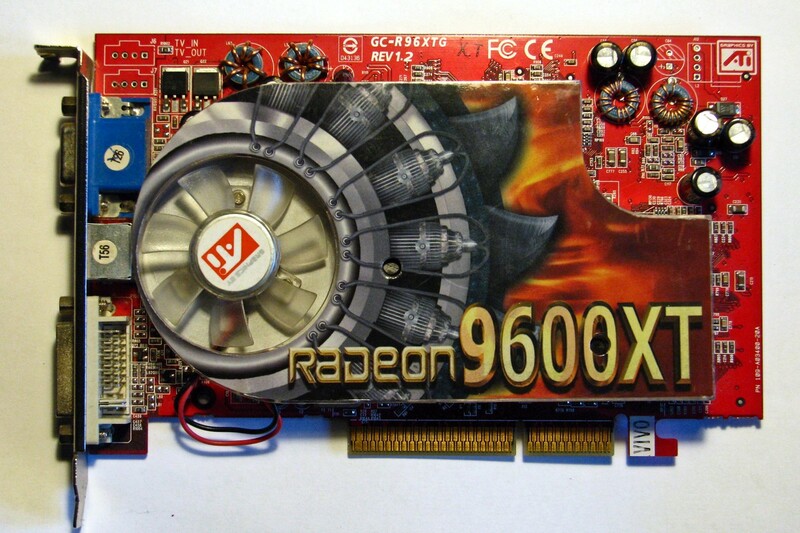 Yes, I could have gotten a more powerful card, like the Radeon 9800 I’ve got in another computer, but this one is really enough for what I’m doing with the computer and it only has an old AGP graphics port, so I’m rather limited in my choices. The most important feature is not really the graphics chip, but the two monitor outputs – I’ve really gotten used to working with two displays especially when post-processing photos and I’ve really missed it in the last few days. Now both monitors are back in action and so am I. The Commodore 64 was one of the best 8-bit gaming home computers of the 1980s and although I had never used it exclusively for playing games, I certainly made no effort to avoid them. There was a huge amount of garbage out there and the old preconception that computer games were only violent and nothing else was at least a little true, but there were also a lot of exceptions. Of course everybody back then traded some games via the schoolyard exchange and while I had a lot of original games, some others were only available via slightly illicit means because at the end of the 1980s many older games were already out of print for a long time. I tried many of the different genres and while there were a lot disappointments, I still found some real jewels in the relatively short time the C64 was my main computer between 1989 and 1990. Here are some of these games, which continue to be my favourites until today. I’m really happy that the games themselves and even the hardware to play them on still exists. Warning, this is a bit of a rant… It seems my computer hardware doesn’t like me anymore! A couple of days ago I noticed that my printer seems to be packing in and today the graphics card in my big computer went belly-up. Although the computer still works and I can use the on-board graphics adaptor, this means that I lost my dual-monitor setup I always use for processing my photos. So this really put a damper on a peaceful Sunday and although I just bought another Radeon 9600 on eBay, the missing graphics card will mean a definitive slowdown in photograph posting over the next days until the replacement arrives. I still have a couple of new photos around, but I won’t be doing any major photo processing with a single screen. I also finally wanted to finish my C64 games article today, but it’s still not ready because the computer troubleshooting took too much time. So there you are as far as lame excuses go :-). I have to admit that I’m hopelessy behind everything at the moment, mainly because that little C64 gaming article ballooned into something a bit bigger which needs a little more time. In the meantime, I’d like to give a huge shout-out to Terry Stewart from New Zealand, who has one of the biggest collection of vintage computers of all sorts, shapes and sizes and shows them all in incredibly detailed videos on his Youtube channel, in articles on Website and also on Google+. I’ve spend a lot of time browsing around and watching his videos, learning a lot about all those other old computer I never knew of. He even has a Kaypro II, which you can see in the video embedded below – it’s not exactly like a Kaypro 2x, the first computer I ever encountered, but it’s very close. 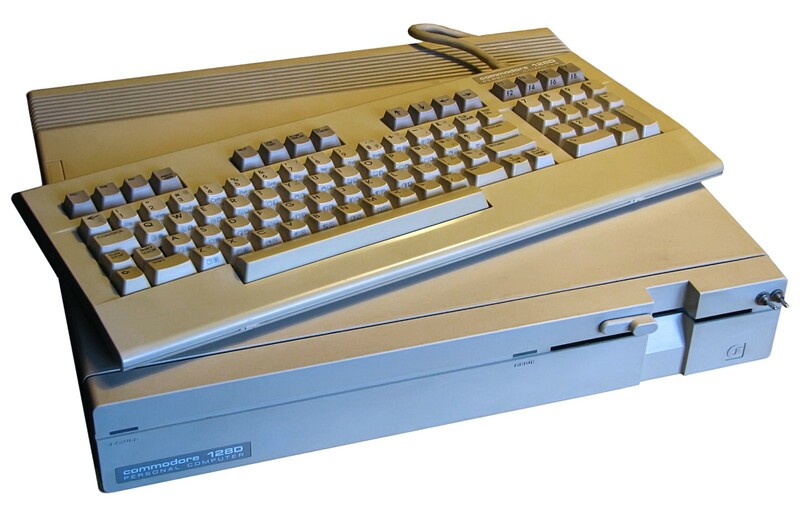 It sounds a little different than a 2x (there’s a short video here with the distinct floppy drive sounds), but the case and keyboard seem to be largely identical – the only differences are the huge vertical floppy drives of the II while the 2x had two half-height horizontal drives. Terry gives a great overview of the available software live on the machine itself and he also shows some of the huge amounts of manuals you got with the computer back then. He also demonstrates Kaypro IV later in the video, which seems to be closer to the 2X than the II. I distinctly remember the rudimentary graphics capabilities which only a few demos actually used, but we never had this rather sophisticated Space Invaders clone – only two games called Ladder (a sort of Donkey Kong clone) and Catchum (a simple PacMan knockoff), all using only ASCII characters! The last Vintage Computing post was more about the Commodore 128 in general, but there was more than just the one machine – the C128D variant was even more amazing, transforming the 8-bit-machine into a real personal computer. This is the story about the “big” C128 and how I ended up with not only one, but two of them. Long after I had graduated from the Commodore 64 to the Amiga and even the PC, I discovered that my 1541-II floppy drive was broken, but I almost accidentially found a surprising replacement with one computer I always wanted to have in the C64 era. 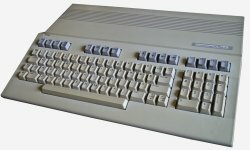 After three articles about the different incarnations of the Commodore 64, it’s now time to talk about Commodore’s flagship 8-bit-computer, the amazing Commodore 128. Some may notice that I have completely skipped the C16/116/Plus4 series, but since I only want to write about the computers I own myself and those have never found a way into my collection, I’ll just suggest the respective Wikipedia articles instead. There are three different C128 models: the standard C128 you see in the top right image, the C128D with its integrated 1571 floppy and detached keyboard and the C128DCR, which is basically the same, but with a part metal case and some inner modifications. 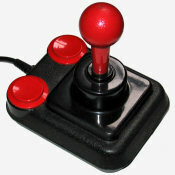 But this first of two articles is mainly about the original C128, which was introduced in January 1985 at the Consumer Electronics Show in Las Vegas, three years after the debut of the C64 and a breakneck development time of only five months. Last week I wrote about the original Commodore 64 in its breadbox shape, which was almost, but not fully retired in 1986 when the C64-II with the new modern case designed after the C128 was introduced. While the new C64-II was overall a success, there was some backlash about the new case which was not liked by everyone. 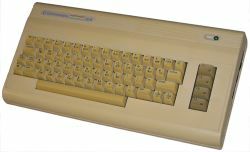 Commodore listened to its customers and in 1987 brought back the old breadbox case, but now in a slightly different colour and with the same mainboard as the C64-II. The look was a hybrid between the two generations of Commodore computer design from the brown tones of the early 1980s and the new beige cases first seen with the C128 and the Amiga in 1985.